The Rugby World Cup has arrived. The first game kicks off on Friday 18th September at 8pm between hosts England and Group A underdogs Fiji. 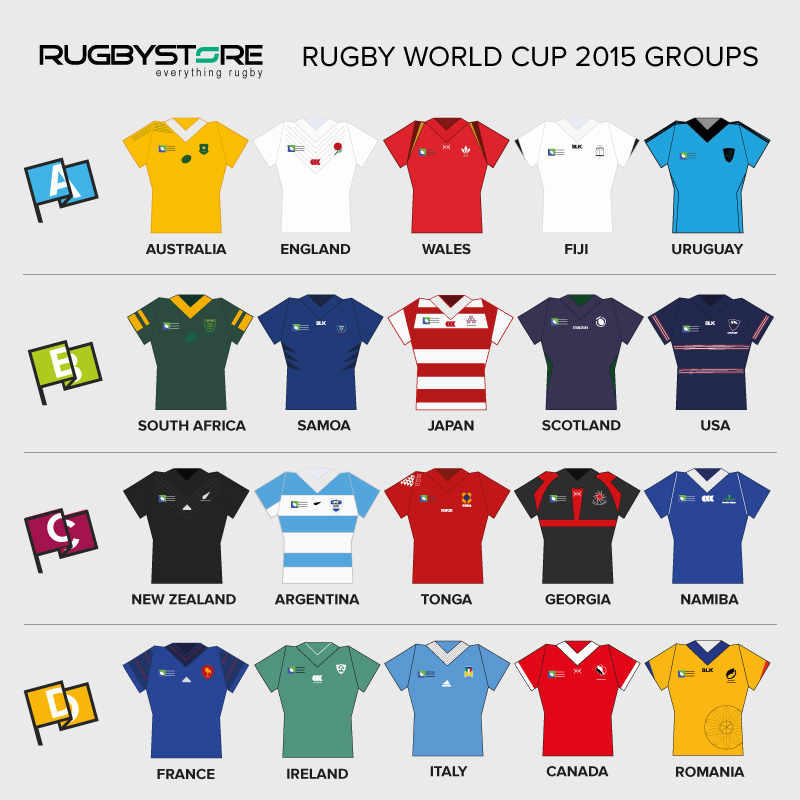 We’ve taken it upon ourselves to provide Everything Rugby World Cup in our RWC2015 101. Here you’ll find the groups, the fixtures, some amazing Rugby World Cup facts, our sweepstake kit, the bluffers guide to rugby and of course where to get all your Rugby World Cup kit. 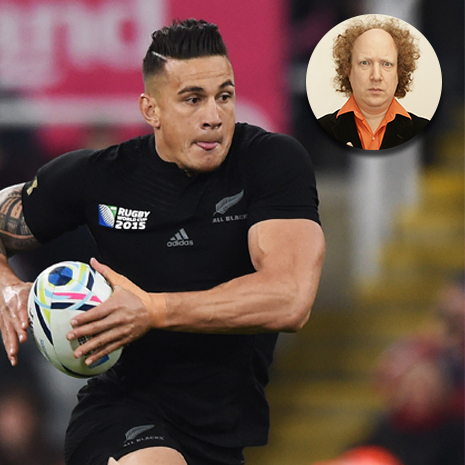 Unleash Your Inner Superfan with our Rugby World Cup 101. 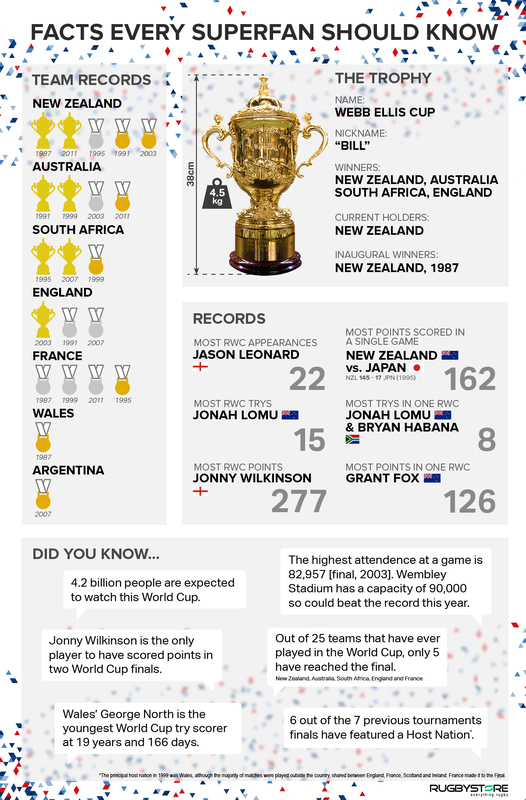 We’ll be looking at all the stats and figures once the tournament is over but here are some of the key facts you should know before watching the Rugby World Cup this year. It’s incredible to think that over a decade since Jonah Lomu took part in the RWC, his record tries scored still holds the top spot. The groups where nations will duke it out for spots in the Quarter Finals were created more than two years ago. Each consists of 5 teams, some of whom automatically qualified based on their performances in the last RWC. Much has been made of Group A, now known as the ‘Group of Death’ which features 4 of the top 10 ranked rugby nations in the world. Some have criticised the draw being so early for putting these top teams together but it should make for a thrilling watch. Find an updated list of Fixtures and Results right here on the rugbystore blog! 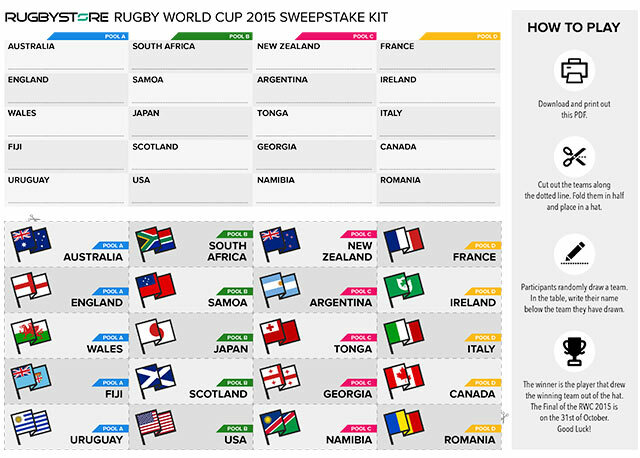 Download your own Sweepstakes kit for your rugby club, office or school here. For a chance to win £150 to spend at rugbystore.co.uk join our Fantasy League! Don’t know a ruck from a maul? Need to brush up on your knowledge of the greatest game in the world? Or do you have a friend that you can’t be bothered explaining every rule to when they come round to watch a match? Our friends over at sportbluff.com have you covered with an easy to use guide to how everything works in rugby. For more information on the laws of rugby, check out our post on rugby law changes for the 2017/18 season. Find live updates, news, offers and fantastic competitions on our social channels throughout the Rugby World Cup. Find us on Facebook, Twitter and Instagram today.